O analiza Stratfor rezuma conflictele din Republica Moldova, respectiv separatismul regiunilor Transnistrene si Gagauza. Desi ambele conflicte au avut doar o scurta parte violenta, ele nu sunt rezolvate si nu pot fi considerate incheiate. As the struggle between East and West intensifies along Russia’s periphery, Chisinau may soon find the country more polarized. The competition between Russia and the West could destabilize Ukraine’s small but strategic western neighbor: Moldova. Russian Deputy Prime Minister Dmitri Rogozin is scheduled to travel to the country’s breakaway territory of Transdniestria on Aug. 24 to celebrate the 70th anniversary of Moldova’s liberation from Nazi occupation. His visit comes amid local media speculation that Moldovan and Transdniestrian security forces may soon clash. However, though political friction is likely to intensify in Moldova as security threats rise, a full-scale conflict remains unlikely. 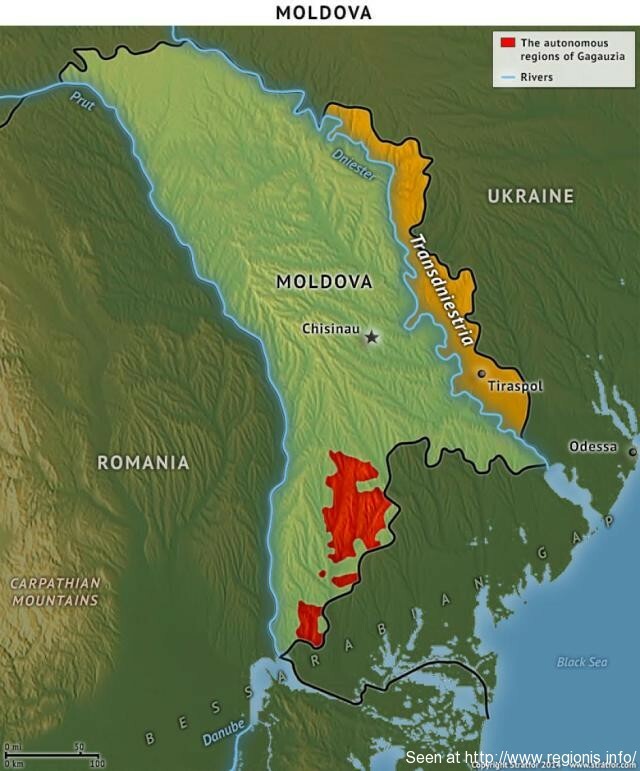 Moscow retains a great deal of influence over Transdniestria, a breakaway region that fought a war with Moldova following the collapse of the Soviet Union. Russia keeps more than 1,000 troops in Transdniestria, and Moscow is the territory’s principal political and financial backer. Since the outbreak of the crisis in Ukraine, Russia has supported Transdniestria even more. It has sent additional weapons to the region, and according to unconfirmed reports, it has also boosted its troop presence there. Still, it is unlikely that there will be a significant military struggle over Transdniestria, but other risks to Moldovan stability remain. Western integration efforts have already created tension in Moldova, in Transdniestria and in the autonomous region of Gagauzia located in the country’s south. Gagauzia’s leaders have criticized Moldova’s free trade deal with the European Union, expressing a desire to join the Russian-led Customs Union instead. And the region could pose an even greater problem for Chisinau in the future, depending how far Moldova takes its push for Western integration.